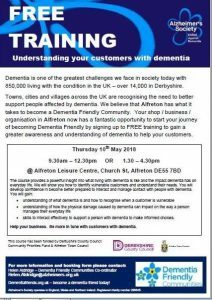 The Dementia Action Alliance are pleased to support this excellent opportunity for Alfreton Businesses and organisations to access a free 3 hour course to help them better support their customers living with dementia and enable Alfreton to become a dementia friendly town. In a quiet ceremony on a busy Saturday morning, Alfreton Town Council remembered the six million Jews murdered in the Holocaust. 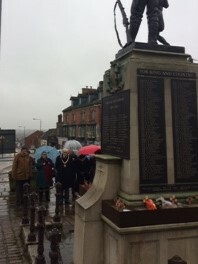 The Mayor councillor John Walker laid a wreath of red and white flowers at the War Memorial on King Street. A reading was given by assistant Town Clerk. The Royal British Legion also took part in the wreath-laying, which is likely to become an annual event. Many other local councils are beginning to commemorate Holocaust Day on January 27. The Holocaust Memorial Day Trust is based in London and supported by the Department for Communities and Local Government. 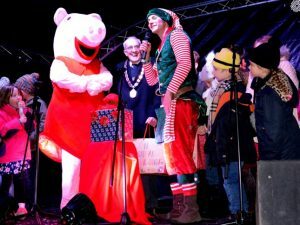 The Town Council were delighted with the gathering of supporters for the Christmas Event and Light Switch On in Alfreton on Saturday 25th November 2017. 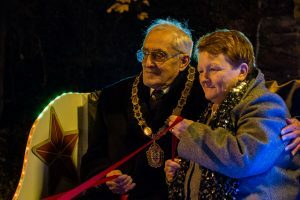 The crowds watched as Peppa Pig and the Town Mayor, Councillor John Walker, counted down for the spectacular illumination of the lights at Alfreton House and along the High Street to the Christmas Tree.